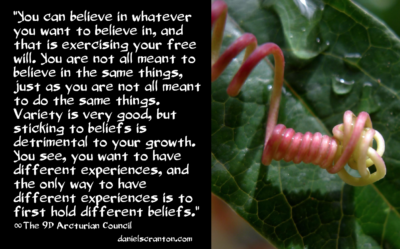 You can believe in whatever you want to believe in, and that is exercising your free will. You are not all meant to believe in the same things, just as you are not all meant to do the same things. Variety is very good, but sticking to beliefs is detrimental to your growth. You see, you want to have different experiences, and the only way to have different experiences is to first hold different beliefs. Notice the way that you put that in your language – you ‘hold’ the belief as if it is stuck to you and you are stuck to it. But if instead you look at beliefs as something you try on to see if it fits, to see if you like it, then you will have an easier time letting go. Then you can see all of this as practice and exploration. Many of you take your beliefs very seriously, to the point where you will fight one another over them. You will hold hate in your hearts for someone else because of what they believe and how it contradicts what you believe. Do not define anyone by their beliefs because then you are adhering to a belief that says that people cannot change, and they certainly cannot change what they believe in. Nothing could be further from the truth. Think about yourselves right now in this one lifetime and how many beliefs you’ve tried on for size. Now, think about all of the different experiences you’ve been able to have because of those beliefs, and you can make peace with the fact that you don’t have to be consistent. You’re not going to achieve or accomplish anything by maintaining the same belief systems for long periods of time. In fact, you will probably just remain in a fixed position, digging in your heels and not being open to receiving new ideas and inspirations, new impulses. You want your beliefs to be as in motion as your e-motions, and you want to be in the flow. So relax and enjoy your exploration of certain beliefs, but be willing to let them go at the drop of a hat.